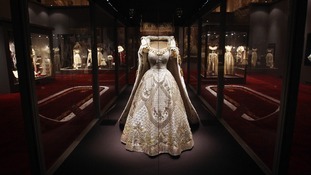 Some of the most iconic outfits and artefacts from the Queen's coronation ceremony have been brought together in a new exhibition, set to launch this weekend. To mark the event's sixtieth anniversary, a collection of dresses, uniforms and robes worn by members of the royal family at the event will be on show in the State Rooms at Buckingham Palace. The Queen's coronation dress will be the centrepiece of the exhibition, which opens to the public tomorrow. Visitors will also get the chance to see private home films of the Queen and Duke of Edinburgh, alongside a young Prince Charles and Princess Anne, as the royal family prepare to be photographed.